Combine all the ingredients and blend well. Can be made ahead. 12 drops or more of Balsamic Vinegar over the top of the roast. Heat oven to 350 degrees. Place the roast in a baking pan with sides higher than the roast to contain the accumulated liquid as it bakes. 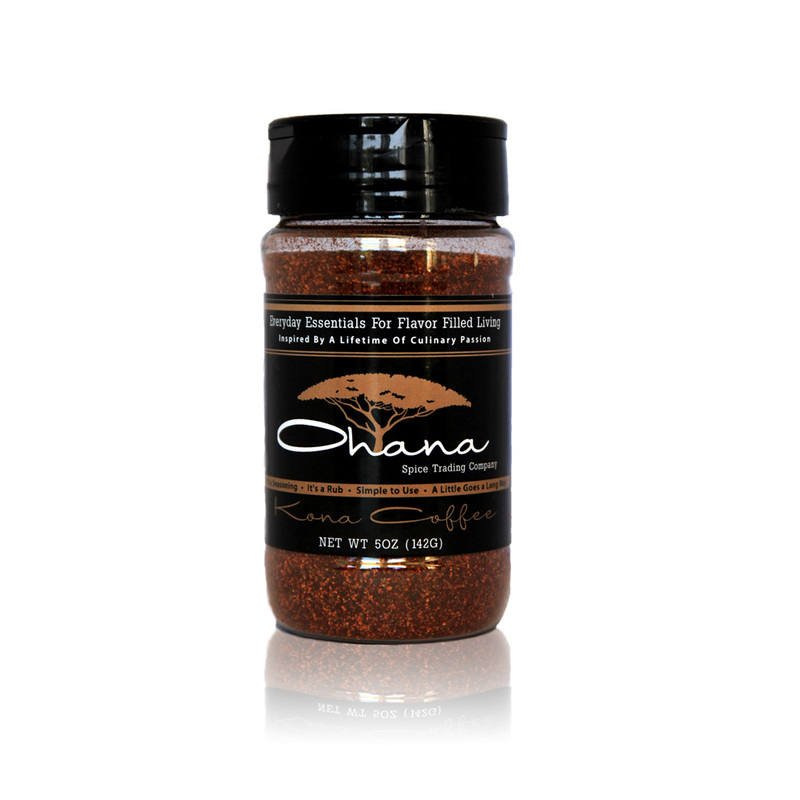 Spread the Ohana Kona Coffee blend and rub it gently to cover the top evenly. Finish with 12 or more drops of Balsamic vinegar. Cover loosely with a peice of foil and bake for 3 hours. Enjoy with roasted vegetables cooked along with the pork during the last hour.  Great for pulled pork sandwiches, coleslaw and BBQ sauce.  Most recipes calling for shredded pork. Place the sliced onion in the bottem of a slow cooker pot. Cut ribs into two or three rib portions and add to the pot. Combine all the other ingrediens in a bowl, mix well. Place onions in botton of the slow cooker add the ribs, than all the other ingredients. Cook on low heat according to manufacture’s directions…. approximately 6 to 8 hours. Prepare marinade, add mushrooms and lemon juice. Coat well and let stand 1 hour. Turn occasionally. Heat oven to 350. Place tomatoes and garlic on foil lined baking pan cut side down. Sprinkle with a few tablespoons of olive oil and roast. Approximately 45 minutes. Tomatoes should be soft and moist. Allow to cool on pan. Remove the skins. Broil mushrooms 5 minutes on each side, until soft or sear them in a hot skillet. Mushrooms can be cut in half. Drain on paper towels. Assemble sandwich in layers of mushroom, tomatoes and cheese. Serve warm or at room temperature. Heat oven to 400 degrees. Place chicken on roasting pan. Squeeze and rub the cut side of the lemon all over the chicken. Mix the Kona coffee spice blend with the olive oil and rub on and under the chicken skin were possible. Roast the chicken for 30 minutes at 400 degrees, reduce the temperture to 350 degrees and cook for additional 45 minutes to a hour. Remove from the oven and allow to stand for 15 minutes before carving or plate the whole chicken for a nice presentation.